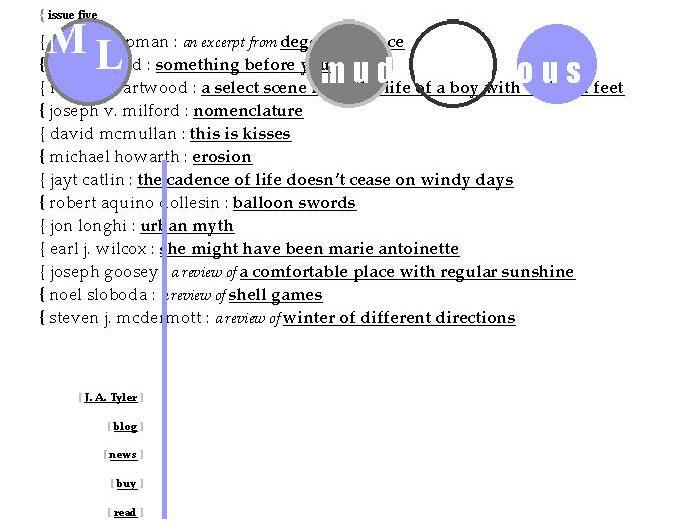 Issue #5 of Mud Luscious (editor: J. A. Tyler) is now available online. It includes works by tyler enfield, robert swartwood, joseph v. milford, david mcmullan, michael howarth, jayt catlin, robert aquino dollesin, jon longhi, earl j. Wilcox, & an excerpt from degenerescence, the forthcoming novel by james chapman. The issue also contains reviews of a comfortable place with regular sunshine by joseph goosey, shell games by noel sloboda, and winter of different directions by steven j. mcdermott.